The Plank, unfortunately, has acquired deep sentimental value, so much so that this smooth slab of wood is considered a living treasure in the Moosey garden. It is subject to a heritage order, and cannot be replaced or upgraded. The soil supports at each end are washing away, and the Plank is fast becoming rather unstable. The Head Gardener has fallen off a few times - very embarrassing. Once she lost a whole wheelbarrowful of mulch while foolishly trying to take a shortcut. Off floated the rotting hay, tantalisingly slowly, to potentially block up a downstream culvert. Oops. 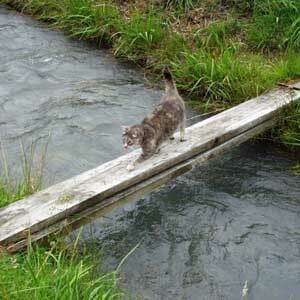 The cats are extremely adept at zooming over the Plank without fear of falling. The dogs, of course, have long enough legs to just plough through the water. But when Rusty was a brand new puppy he fell off and had to swim to safety, while his accompanying humans chuckled rudely. Another oops! The Plank is actually wooden two planks, balancing on top of each other. 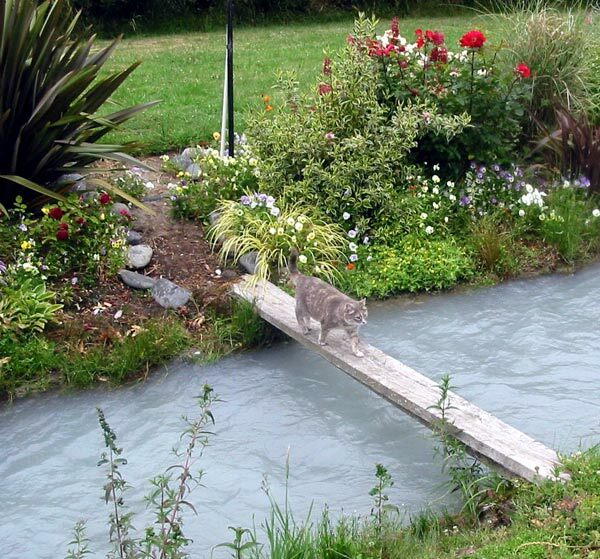 The cats and I used walk the Plank when we wanted to cross the water race to the newer gardens by the Willow tree. Back in the days when the two grey sisters Jerome and Stumpy were alive, it was the last bridge on our twilight walking circuit, a bit bouncy and on a bit of an angle. The cats didn't notice this, but humans can get a bit of a surprise. 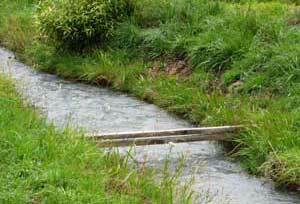 The Plank was first thrown over the water race well before any gardens existed on the other side. The position chosen was quite arbitrary, and it was used for walking access. This soon changed to walking-with-wheelbarrow access, after the gum trees over the water race were chopped down (in the winter of 1999). 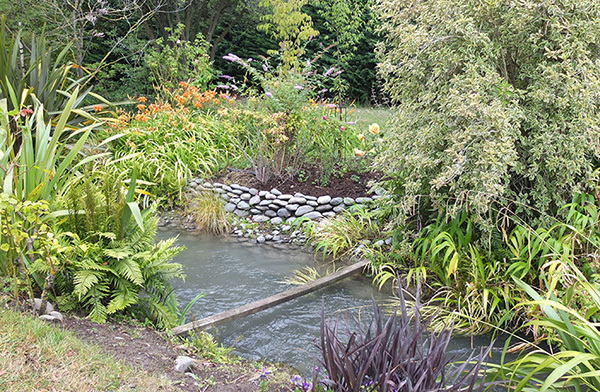 In the Spring of 2000 the new gardens started quietly spreading along the water race, and The Plank became an important landmark, chosen to mark the end of the Dog-Path Garden. 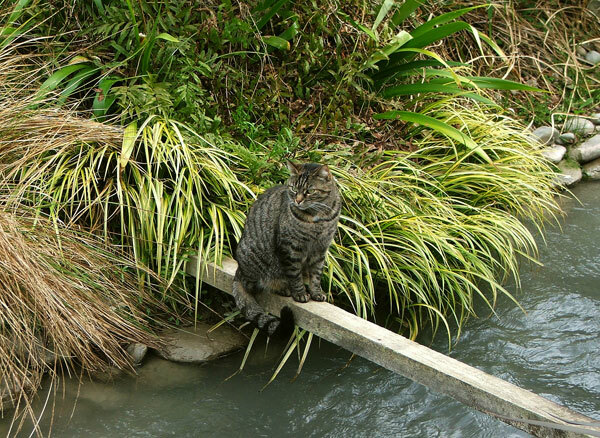 The Plank is the lowest bridge to the water. I used to stand sideways in the middle watching the water rushing past, and The Plank would bounce gently up and down like a diving board. Jerome would often stop half way across to sit in a cat trance. When people do this they would usually be thinking about the meaning of life, and/or gardening. Jerome's mid-plank dreamings were much more down to earth. In heavy frosts the Plank can be icy. Taj-dog, the original dog, found this out on one of his winter morning walks, sliding sideways into the water race. It was a timely reminder to his walking people companions, who were not even wearing sensible shoes at the time. The Plank marks the division between two colourful waterside garden borders - the Dog-Path Garden to the left and the more recently developed Willow Tree Garden to the right. So far, at the time of writing (January 2017) I have resisted all suggestions to replace this piece of Moosey memorabilia. But my days of tripping deftly over it are well gone. Did I use the word 'trip'? Help! 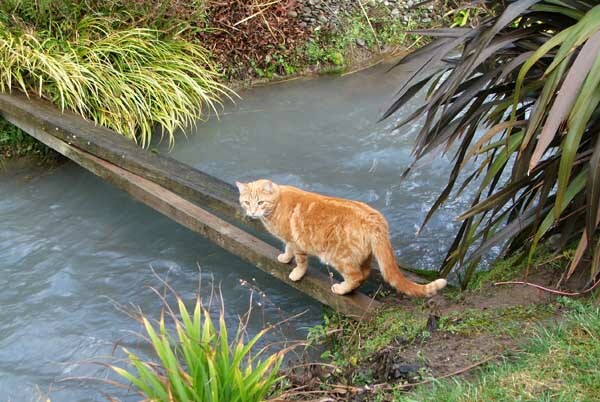 In late January 2005 one of the approaches to The Plank washed away, catapulting a startled garden visitor into the water. 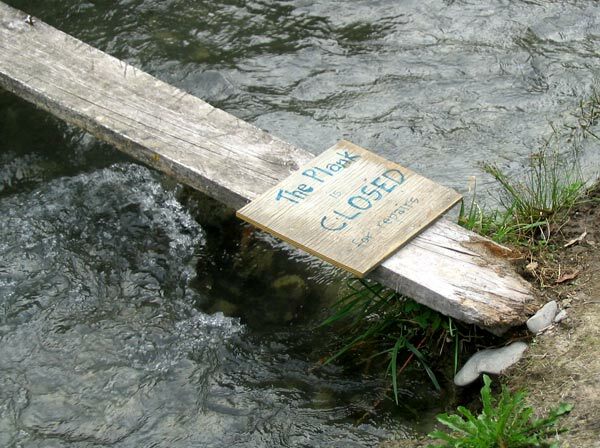 And in the next months, un-noticed, one of the pieces of wood also disappeared downstream. Oops. 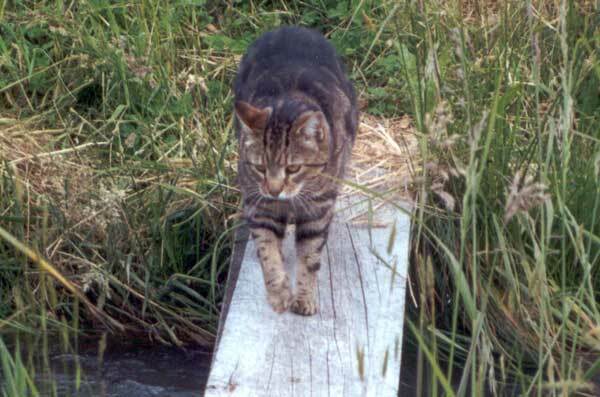 So one day The Plank may have to be relegated to the Moosey archives, like Sifter the cat (who left us for greener pastures some years ago).